Does your hair look and feel dry, dull, thin and damaged no matter what you do or apply? 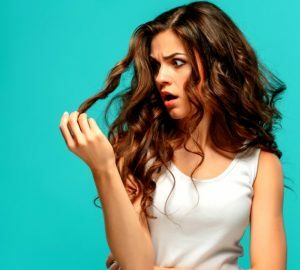 Is excessive hair fall thinning your crowning glory? Are your nails weak, forever chipping and never really grow long no matter how much care you take? Is your skin dull and glow-less? If so; it is likely that you are suffering from biotin deficiency. Taking a quality biotin dietary supplement can help improve health of your hair, nails and skin. Let’s know a bit more about biotin. Biotin is a vitamin from the B complex family of vitamins. Also known as vitamin B7, this water soluble vitamin has one more name that summarizes its benefits rather aptly – it is called Vitamin H or Hair Vitamin as it improves hair health. Biotin is needed to metabolize and convert macronutrients (proteins, fats, carbs etc) present in the food we eat to bioavailable forms that the body can utilize easily. Without adequate biotin, the body will not be able to derive proper nutrition from the food it has eaten and digested. How does biotin affect health of hair, nails & skin? Hair, skin and nails – all contain a vital protein called keratin. Biotin improves keratin infrastructure in the body. The exact biochemistry of how it happens is still not clear to the scientists but the research has proven again that taking more biotin improves hair, nails and skin. Actually, this connection was first discovered when horses with brittle and cracking hooves (also made of keratin like hair and nails) showed considerable improvement when given biotin supplements. Modern research on human being has also shown that taking biotin supplements reduces hair fall and improves hair health. Why does biotin deficiency occur? Biotin is available in several foods (liver, eggs, cheese, nuts, bananas, avocado, cauliflower, whole grain bread etc). However, as this is a water soluble vitamin, our body can’t store it for future use. Whatever surplus biotin we have on daily basis, it gets secreted out through urine. As most people are not really very particular about their nutrition on daily basis, biotin deficiency can occur. The long and short of this means that we need to have adequate amounts of biotin in our diet every single day! If your everyday diet is lacking in adequate biotin, or if your hair, nails and skin are showing wear and tear, a biotin supplement may help a lot in remedying the situation. Does biotin have benefits beyond hair, skin and nail health? Yes, of course, the benefits of adequate biotin go way beyond healthier hair, skin and nails. Biotin is also linked to reduced inflammation, better cognitive function and improved cardiovascular health. How to choose a good biotin supplement? • Biotin is a safe supplement. Still, if you are on any prescription medicines, or pregnant or nursing, do check with your doctor first. • Also check the label for absence of magnesium stearate (can be toxic). • If allergic to gluten, check that it is 100% gluten-free. • If you are a committed vegetarian or vegan, do check for vegan/vegetarian capsules. Do note that softgel capsules are made of gelatine that’s sourced from animal bones. We recommend WOW Biotin Dietary Supplement Capsules that are the best you can get in the market. WOW is a reputed seller known for its superlative personal care and healthcare products and supplements. 100% natural and 100% vegetarian, these are ideal for helping improve hair, nail and skin health. Each capsule contains a healthy 10000 mcg dose (plus 60 mg calcium for stronger bones) to help restore glow, growth and glory to your beauty assets.